Recently I was lucky enough to spend some time with Rich Roll best selling author, podcaster, and Ultraman who was named one of the 25 fittest men on the planet. We were both on retreat and our guests for the day were Stephen and David Flynn founders of the multimillion euro ‘Happy Pear’ Empire. The boys are exceptional in the alcohol-free category. They quit the booze when they were just 21, which is almost unheard of – especially in Ireland. After committing to run the Dublin marathon, the boys were in a panic. They were 21 and like most Irish lads were out partying and drinking – a lot. With just a month to go before the race, they had completed zero training. So they needed something drastic. A friend mentioned this new concept called a ‘detox’; it was 18 years ago. Part of the detox involved taking a complete break from the booze. Out of options, they decided to give it a go. Just one month later they smashed the marathon and felt fantastic. After the race, they caught up with their mates and the beers were flowing, but the boys were no longer interested. With the alcohol out of their systems the boys felt so good in their bodies and minds, they decided to stay on their alcohol-free adventure. During this time they both decided to move towards vegetarianism. This change in diet coupled with their alcohol-free living started a love affair with food and wellness. On returning home to Ireland, they shared the same goal – to start a healthy food revolution. With the extra time and energy from avoiding hangovers, the boys created ‘The Happy Pear’ empire. They started with a small veg shop and a big dream. This developed into a cafe, farm, product range and roastery. They lads also run online Happy Heart courses and are part of Jamie Olivers Foodtube network. You can find them all over social media. What I love about the lads is that they have the best fun along the way. I would challenge anyone who believes the conception that you need alcohol to have fun, to spend 5 seconds with these guys and still believe in this myth. The boys are living the alcohol-free dream, surrounded by family, friends, bags of fun and healthy living. Rich took the classic route if there is such a thing. His drinking spiralled out of control to the point where a rock-bottom moment led to change. Before the booze Rich was an all-star swimmer, gaining a place on the star-studded Stanford swim team. But as his swimming career stalled, his drinking career took off. That being said, like so many people, Rich was still able to excel at college and later, he was earmarked for a fast-track partnership within a prestigious law firm. As his relationship with alcohol spiralled downwards, Rich looked for help. After several failed attempts at rehab, he hit bottom, being prosecuted for DUI, this experience left him open to change, and he rediscovered the AA. Rich is very clear that the AA saved his life and everything he has today he owes to this movement. He still attends weekly meetings and was kind enough to let me sit in on a meeting while in Ireland. Aged 40, sober but unfit, 50lbs overweight and unhealthy Rich decided something had to change. So he started to run, a lot. Very quickly he lost weight, felt great, changed his diet and kept running. This ignited his former passion for swimming and training. Over the next couple of years, he went from couch potato to ultra-man athlete. His book about this transformation ‘Finding Ultra’ is not only a magnificent read but helped inspire me towards a new alcohol-free healthy lifestyle. I owe Rich a lot. Inspired, Rich started the ‘Rich Roll’ podcast which is now the best in the land. 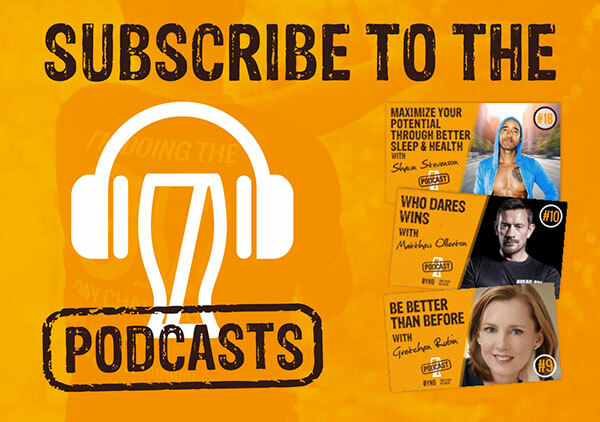 If you take one thing away from this article – start to listen to the Rich Roll podcast – it’s a game changer. Many of the guests have helped shape my world. ** If you listen carefully to this episode – you will hear my dulcet tones about half way through! Having spent time with Rich, it is clear that his life is full of passion. He is doing what he loves and inspiring millions at the same time. He is great fun, enjoys a laugh and could not be happier. I am now lucky enough to call Rich a friend and mentor and he is someone I will always look up to. Unlike Rich, there was no rock bottom or major “problem”. I just suspected alcohol was holding me back from being my best and I was right – it was. I had a great job, lovely family and all the visible trappings of success, but something was missing. My overall happiness was 6 out of 10 when iI should have scored 8 or 9. I felt tired most of the time, and my motivation was at an all-time low. My dreams and goals were slipping through my fingers. I was unfit, unhealthy and unhappy. Having tried every type of wellness idea from mindfulness to physical exercise, I was struggling to make any real progress. Out of desperation, I had to face the truth – it was time to take a break from the booze to see if it helped. But I found it hard. The social pressure I had built over the years, as the larger-than-life party guy, was immense. My rubber arm was continually twisted until one day I realised I needed an excuse to get people off my back. So I created my own excuse – The One Year No Beer challenge. Most people love a challenge and giving up the alcohol for a year was a monster one. After several departures from the wagon and lot’s of learning, I eventually made it to 28-days and felt AMAZING. So I kept going. 28-days became 2 months and then 90 days and this is when everything changed. Very quickly I started to get fit. Exercise routines were no longer interrupted by hangovers. Those cringe-worthy calls to the personal trainer regarding a mystery bug I’d picked up the night before dried up. Combined with my newfound energy and vitality, I was training hard. I started to notice the way certain foods made me feel lethargic and tired. Without the fog of hangovers, it was possible to tune into how my body was feeling, what nourished me with energy and what depleted this source. The combination of quality nutrition and exercise helped me lose weight: 3 stone (42lbs) in total, with body fat dropping from 30% to below 10% where it is today. I went back to university to study part-time, completing a degree and more recently a masters in positive psychology. During this time I trained in NLP becoming a master practitioner and mindfulness awareness coach. Also, my relationships flourished both at home and in the office. Business was booming, productivity was through the roof, and I felt great – bloody great. Inspired, I decided to team up with Ruari Fairbairns to try and help as many people as possible make this positive life change. So we created One Year No Beer a 28,90 and 365-day stigma-free, alcohol-free, fun challenge. As I write this today, I have been on this alcohol-free adventure for the last four years, and it is still the best business and life decision I ever made! Hopefully, you can see the common thread. We all changed one habit and unlocked our full potential. We are fit, healthy, thriving in our chosen professions and loving life. PLUS – we are all having a blast along the way. You might not want to give up forever and that’s totally cool – but aim to quit for long enough to experience all the amazing alcohol-free benefits and then see how you want to proceed. You might surprise yourself. The truth is that the vast majority of us could do with drinking less and rediscovering what it’s like to feel truly healthy again. So, if you want the promotion, faster time, better relationship, slimmer body, improved sleep or want to achieve something BIG this year then going alcohol-free will give you a shot at the title. If these stories help inspired you to take a break then join me and on a 28, 90 or 365-day challenge. There is never a perfect time to transform your life – so make it happen today. If you use this guide you will be able to stay alcohol-free in any situation. PS – If you want to know more about my productivity adventures I am LIVE on the ‘OYNB Instagram‘, my ‘personal Instagram‘ and Facebook page every morning at sunrise – before work! Click on our book to grab a copy – ‘The 28-day alcohol-free challenge’, which is your perfect guide to any alcohol-free adventure.